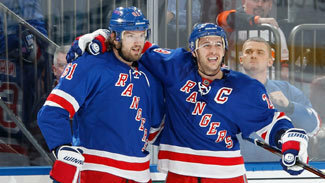 NEW YORK -- John Tortorella summed up what Rick Nash has meant to the all-of-a-sudden streaking New York Rangers in three quick words. "He's ignited us," Tortorella said. Isn't that why the Rangers gave up some key pieces off their 109-point team last season to acquire Nash over the summer? The answer is yes -- and Nash is making Ranger fans forget all about Brandon Dubinsky, Artem Anisimov, Tim Erixon and that first-round pick that now belongs to the Columbus Blue Jackets. After missing four consecutive games with an undisclosed injury -- the Rangers went 0-3-1 in those games -- Nash has returned energized and aggressive and the Rangers are 3-0-0. He scored twice in the third period Tuesday night to carry New York to a 4-2 win against the Philadelphia Flyers; a victory that lifted the Rangers over the Flyers in the Eastern Conference standings. NEW YORK -- Ilya Bryzgalov was asked to summarize the first half of the Philadelphia Flyers' season following a 4-2 loss to the New York Rangers on Tuesday night, one that dropped his team to a game below .500 and out of the top eight in the Eastern Conference. The goalie took a deep breath and exhaled as he looked to the ceiling of the visitors locker room at Madison Square Garden, as if the answer was written up there in invisible ink. Perhaps unable to think of a diplomatic response, he instead gave a short, blunt one. "Not good," Bryzgalov said. "We're not good." Through 24 games, the Flyers are 11-12-1, one point behind the eighth-place Rangers in the East. That place in the standings is somewhat of a mirage; the Flyers are one of two teams in the conference to have played as many as 24 games. They are 10th in the East in points percentage, 22nd overall. The Flyers had won two straight, three of four, and five of seven before succumbing to a pair of third-period goals by Rick Nash that turned a 2-2 game into a disappointing loss. They held a 2-1 advantage before Ryan Callahan's second goal of the game with 41 seconds left in the first period sapped their spirit and helped drop them to 4-9-0 away from Wells Fargo Center. "We obviously are not in the spot we wanted to be," said Bryzgalov, who made 16 saves. "The farther we're going to be, it's going to be more ugly. What else can I say? This is the reality." He was asked what has to be better for the Flyers in the second half, which starts Thursday at home against the Pittsburgh Penguins. "I can't afford to say this," Bryzgalov said. "We have coaches who've got to be responsible for the improvements." A major problem against the Rangers was line changes, with two of the four goals allowed by the Flyers the result of poor decisions about getting off the ice. Callahan's tying goal came with Flyers defensemen Erik Gustafsson and Luke Schenn caught heading to the bench when they should've been patrolling their blue line. Rangers defenseman Ryan McDonagh intercepted a pass that misfired from Brayden Schenn and quickly moved the puck ahead to Callahan. A panicked Luke Schenn slid to disrupt what was a 3-on-2, but Callahan slipped around the fallen defenseman as if he were an area rug and beat Bryzgalov. ROW = total number of regulation plus overtime wins. For tie-breaking purposes, wins obtained in a shootout are not counted. For full standings tiebreakers, click here. Nash's second goal came with Luke Schenn departing the ice too early. This time, Schenn reached the bench as Nash exploded down the left wing. Defenseman Kimmo Timonen tried to get over to slow the Rangers forward, but his hook did nothing to prevent the goal that put the game away. "We can't do those kind of mistakes in these kind of games," Timonen said. "It bites you in the [end]. Those are, to me, mental mistakes. It's reading the play and staying on the ice when you can't change. Those things should be easy to fix. But it's more mental. If you're tired, you still can stay out there. Sometimes it's reading a play. Sometimes it's a turnover that causes a bad change. It cost us the game today and we need to learn from it." The knowledge needs to be absorbed quickly, with the Flyers in the midst of a crucial week against mostly top-flight opposition. After facing the Penguins, the Flyers travel to play the Boston Bruins on Saturday, then come back home to take on the Buffalo Sabres on Sunday. Before Tuesday's game, Flyers forward Max Talbot said this meeting with the Rangers was his team's "most important" of the season. For Flyers captain Claude Giroux, who said Tuesday's loss was about executing in the third period and came down to isolated mistakes that the Rangers turned into goals, took the more traditional approach to the importance of games with the Penguins and Bruins. "All our games are big," Giroux said. "The next game is going to be the biggest game of the season. After that, we have to move on to the next one, and that's going to be the biggest game of the season. We have to find a way to play our best and just keep trying to get better." Flyers forward Scott Hartnell said, "It's going to be a big week for two months. We can't be frustrated by this. We have to learn from it. Obviously we have a couple big opponents right through the weekend. We have to get our game back. We have to find a way to get going."